HUGE shoutout and thanks to the diehard Bike Newport volunteers who are signing roads, and meeting, greeting, and parking 1800 people on bikes every day here at Fort Adams. Neither sun nor heat nor sweat nor grease stops these great folks from getting it done – with a smile! It’s a sight to see. And it’s shattering records. 50% more than our Friday record of 1200 and 20% more than our Saturday record of 1500. HERE’s how we roll – for more Folkfest snaps and videos visit @bikenewportri on Facebook, Instagram and Twitter. 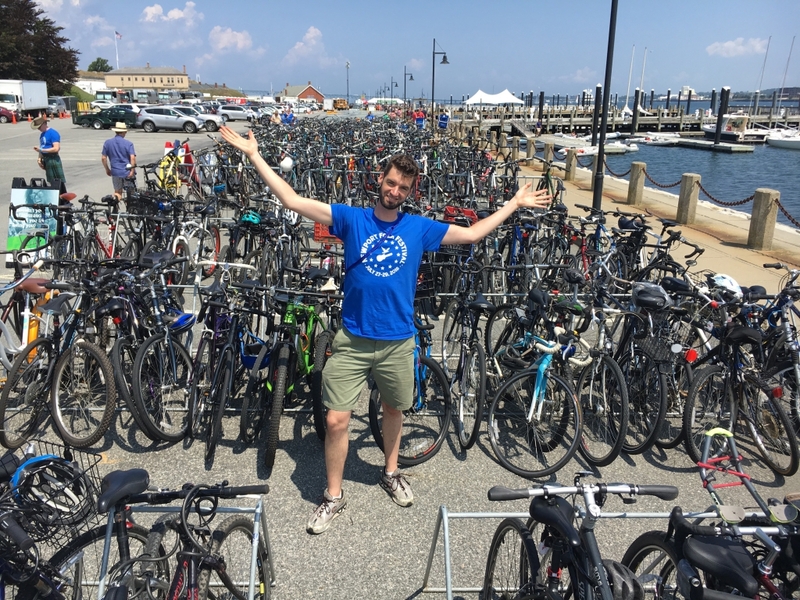 For more information on how you can bike to Fort Adams for summer events, click here. Another big shoutout to the Newport Police Department who are getting lots of kudos for their good cheer managing all these bikes amidst the traditionalists – aka motorists 🙂 Thanks to Sgt Cortes and the NPD! Ride safe. Ride happy. Always ride to the Folk and Jazz Festivals!